Buying a new car should be a fun and enjoyable experience. When you purchase a new vehicle you might think that its paint is flawless, but in most cases it is not. Once you purchase the vehicle the dealership will begin the process of “vehicle preparation”. This normally involves service technicians at the dealership removing the white plastic protective covering on the inside and outside of the vehicle. Then, the technicians will proceed to execute a “quick detail” on the vehicle. The tech will spray the vehicle down,with water and wash the vehicle with a stiff long bristle brush, and contaminated car soap. Then, they will dry the car (in most cases) with old, used, towels, and usually apply a coat of spray wax to make it shine. For the interior they will again remove any plastic protective coatings, and do a quick detail on the interior. Normally, the technicians will use an overwhelming amount of cleaner (Armor-all or similar). This is very dangerous because the of the slick properties in these chemicals. Especially if the technician uses these products on seats, pedals, steering wheels, and shift knobs. The moral of the story is, when you buy a new car tell the dealership to leave all of the plastic protective film on the vehicle as is. Tell them not to wash the vehicle, or detail it in any way. When a detailer uses harsh chemicals, dirty hard bristle brushes, and contaminated towels and wash buckets to clean the vehicle this causes surface scratches. In some cases this causes irreversible damage to the vehicles paint shine and clarify. The same will go for the interior. Ensure that the dealership does not remove any protective films or coverings from the seats, steering wheel, floor matts ect. 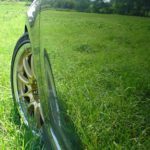 Take your new vehicle to a reputable professional detailer. At Minor Details we will remove all of your protective film and perform a multi step process to ensure that your new vehicle paint remains flawless. We use a “two bucket” system, clean MICRO FIBER wash mitts and towels, and professional foam cannons. The foam cannon ensures that there is minimal contact with the painted surfaces when washing the vehicle. The micro fiber products ensure that when contact is needed, the materials will not scratch your paint.